Love or hate this sequel to Silence, there is no denying that Ridley Scott did a masterful job with what he had to work with (even correcting the greatest sin of the novel by outright changing the book’s universally-deplored ending). A film rich in visual depth, both in the old world and the new, this edit merely goes to enhance a beautiful romantic art film. It’s merely incidental that the unrequited love is between serial killer who eats his victims and the agent tracking him. 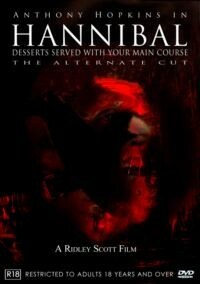 And so, ADigitalMan presents and extended alternate cut for you entitled “Hannibal: Desserts Served With Your Main Course.” Get out the fine china and crystal, enjoy all the goodies you are treated to during this feast of a film, and prepare for the most cerebral dinner party you will ever experience. - An extended alternate cut. About 22 minutes longer, this reintegrates most of the deleted material. After re-editing the Star Wars saga to his own satisfaction, fan editor ADigitalMan began looking at other films he has appreciated over the years and, where possible through the availability of good supplemental material, has extended them through the judicious addition of deleted scenes and alternate takes. Here he has attempted to create an alternate cut of Hannibal, the adaptation by acclaimed director Ridley Scott of Thomas Harris’ controversial follow-up to Silence of the Lambs. ADigitalMan has integrated over a dozen deleted scenes to bring the running time around 2:30. - In an attempt to make the movie fit better as a sequel to Silence, it was imperative to restore Clarice’s trip to the dungeon as she looks for clues to the whereabouts of her old nemesis. Meanwhile, as Hannibal sets up Inspector Pazzi in Florence for the ultimate tribute to Pazzi’s infamous ancestor, he can’t help but offer advice about another serial murderer terrorizing historic Florence. - And while “Il Mostro” isn’t as central a figure as “The Tooth Fairy” or “Buffalo Bill” were in the previous stories, we come to know that Hannibal may indeed know more about the killer than he is letting on. More important exposition is restored as well, including the fate of Jack Crawford, the escape of Hannibal from Florence, and the moment of clarity for Hannibal when he fixates on Paul Krendler in the final act. - Finally, a custom modified version of the alternate ending is presented here, with more subtlety and grace than the theatrical cut or even the supplement allowed.